It would have been easy for the NRA to continue its complete silence after the Las Vegas massacre as public pressure mounts against the gun rights organization. But to its credit, it has waded into the discourse with an absolutely incredible gesture: The NRA is giving each each of the Vegas shooting victims a perfect NRA scorecard. Wow. It’s great to see America’s foremost pro-gun organization finally stepping up to address this terrible example of gun violence in our country by bestowing those lost with its most powerful form of recognition. Earlier today, NRA president Wayne LaPierre held a press conference to explain that each of the 58 people killed on Sunday night will receive an official A+ grade from the NRA Political Victory Fund. 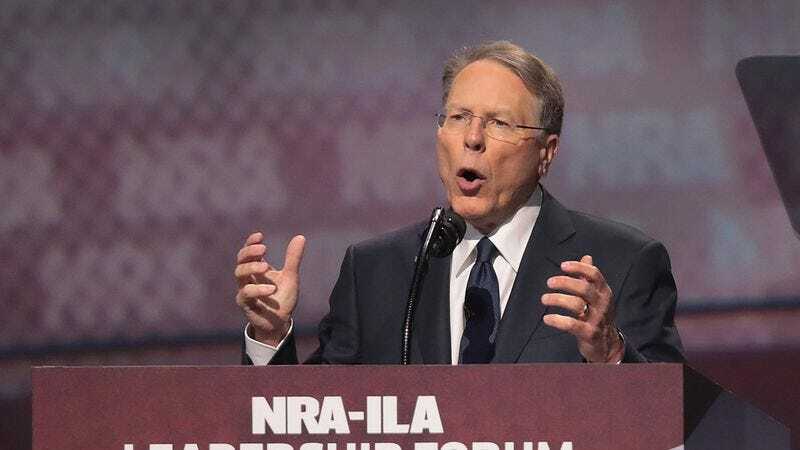 “An A+ is the highest honor we offer to American patriots who exemplify the values of freedom and liberty that the NRA holds dear, from fighting against magazine restrictions to ensuring all Americans can carry a concealed weapon,” LaPierre said. “When we release our report this year, the fallen from the Mandalay Bay tragedy will be listed at the very top, along with fellow top score getters like John McCain, Marco Rubio, and the dozens of others who work endlessly to ensure everyone has unfettered access to firearms,” said LaPierre. These perfect scorecards, which are available on the NRA Political Victory Fund website, will surely bring some measure of comfort and closure to the loved ones of the people who lost their lives in Las Vegas this week. The NRA stands for gun rights and personal sovereignty, and now it has proven that it stands for every law-abiding citizen who is a part of the country that keeps those rights alive. Well done, NRA.